The Unified Police Department (UPD) of Greater Salt Lake is a Police Department serves many Salt Lake County cities and communities. The UPD allows communities to have comprehensive police services at a fraction of the cost of establishing and maintaining their own police force. By combining a variety of police services such as SWAT, forensics, records, and dispatch under one organization, communities can share the costs with other communities, saving local governments and reducing the tax burden of citizen. How is the UPD Organized? 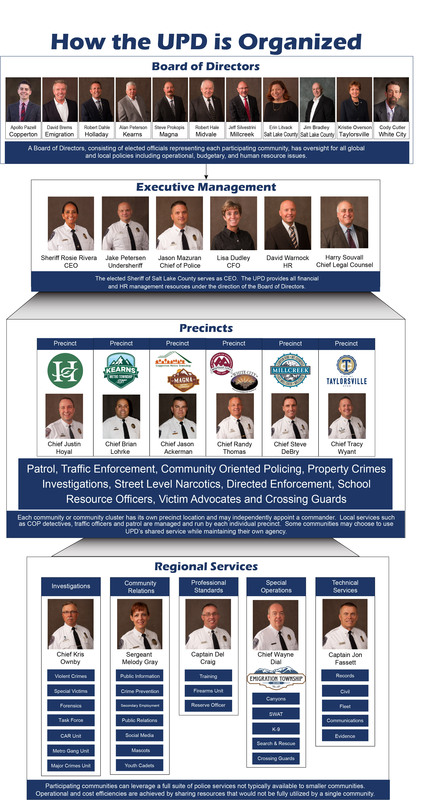 The UPD is run by a Board of Directors consisting of elected officials from the communities the UPD serves. Day-to-day operations are run by the Sheriff who acts as CEO. The Sheriff oversees a large group of pooled services that are used by all the communities the UPD serves including things like SWAT, Forensics, Dispatch, COP, the CAR Unit, K-9, and Media Services. In addition to managing shared services, the Sheriff oversees local precincts, each with its own Commander who is chosen by each respective community. Commanders run each local precinct and have authority over local operations such as COP, traffic, patrol, and crossing guards. This flexible structure allows participating communities to take advantage of the cost savings and efficiencies of pooled services while retaining local control over precinct-level operations. To see a graphical representation of how the UPD works, click on the chart to the left.